The new Day Care Center run by Caritas Georgia, and supported by CNEWA, is teeming with activity. Last week we received a brief update from our friends at Caritas Georgia, describing activities at their recently dedicated Day Care Center. (You may remember we posted about this event last year.) The winter has brought snow to Eshtia, Georgia, but in many other ways, it feels like a new springtime. Read on. After equipping the Center with all the necessary equipment, furniture and computers, in February 2018 we hired the Center staff. Currently we have 116 children registered in the Center, with seven project staff supervising them. Total number of project staff is 7. We also have a vocational workshop of weaving and felt. The girls from the village attend the Caritas Georgia Art Therapy Studio project, developing important job skills. On Sundays the children attend the catechism class led by Father Anton Antonyan. 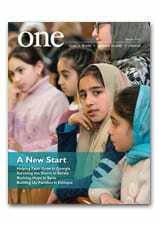 We invite you to read more Caritas Georgia in A Letter From Georgia in the Winter 2016 edition of ONE. Eritreans walk through Asmara, Eritrea, marking the Feast of Kidane Mehret on 25 February. Last weekend, hundreds of Eritrean Christians turned out to mark an important feast on the Ethiopian and Eritrean calendar. The Ethiopian and Eritrean Orthodox and Catholic churches have a tradition that after Jesus’s Ascension, his mother went to Calvary to pray to him for a favor. Jesus descended in a host of angels to ask what she wanted. Mary asked him to save anyone who would pray or do works of charity in her name. Jesus’s promise to do so is known as Kidane Mehret, the Covenant of Mercy, remembered on Yekatit 16 in the Ethiopian calendar. This usually corresponds to 23 February in the Western calendar; some churches celebrate the feast of Kidane Mehret on the nearest Sunday. Friends and supporters of CNEWA may also recognize the phrase “Kidane Mehret” from the children’s home that bears that name in Addis Ababa — another reminder of God’s mercy at work in the world. In the video above, Msgr. Kozar describes visiting the “unreached” in the northern half of India. By way of a little background, CNEWA’s work in India focuses on assisting and accompanying the Syro-Malabar and Syro-Malankara Catholic churches. These churches trace their heritage to the time of St. Thomas the Apostle. As mission-minded churches, its members reach out all over the world, dynamically serving as proclaimers and evangelizers. But we have concentrated much of our support for these churches in the south — specifically in the state of Kerala. Thanks be to God, the churches in Kerala have flourished; many young men are drawn to the priesthood, and young women, though perhaps in slightly fewer numbers, are becoming sisters. Little by little, the church in southern India is becoming more and more self-sufficient. But now the great call of these churches is to reach out to the real mission territory of India: The spiritual sons and daughters of the Apostle Thomas have undertaken a new missionary thrust to evangelize the “unreached” in the northern half of India. Check out the video for an intimate glimpse at life in this corner of the world. Worshipers pray at St. George Chaldean Catholic church in Tel Eskof, Iraq, which was damaged by ISIS militants. Iraqi Catholic leaders are urging Christians to remain steadfast in this Lenten season as they encounter challenges of ISIS’ legacy in their historic lands. Iraqi Catholic leaders are urging Christians to remain steadfast in this Lenten season as they encounter challenges of the ISIS’ legacy in their historic lands. “Many Christians today live in a crisis of faith and intellect because of the circumstances of war, instability, migration and the dominance of social media on the details of their daily lives,” he wrote in the letter, released on 21 February. Many Chaldean Catholics lost their homes, properties and other possessions as they fled ISIS militants in the summer of 2014. Many are destitute, still living in camps for the internally displaced or sheltering abroad. But he and other Catholic leaders told Catholic News Service there are many challenges to those Christians hoping to return home after the ISIS occupation and expulsion.